I've been dying to read this book for over a year now, so let's just say that I had pretty big expectations when I started it. And although I definitely enjoyed Splintered, it wasn't everything I'd hoped it would be. I loved the deliciously creepy world of Wonderland and the gorgeous writing, but the plot was so slow and the romance was terrible. What I liked: The world-building. Just wow. The author did a fantastic job of taking the story Carroll created and expanding on it and adding to it with great detail. She really did her research for this book and it shows - the world-building, the descriptions, it's all very well-done. 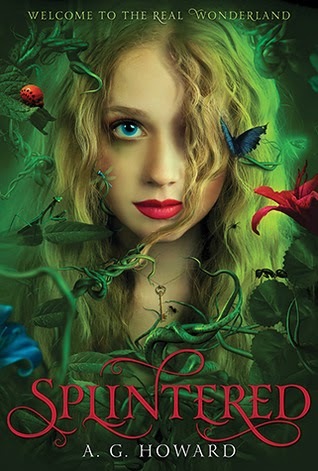 I love how Splintered isn't a retelling of Alice in Wonderland. It's completely different: it takes the story of Alice in Wonderland and adds a new spin on it. This unique idea makes Splintered stand out from most YA retellings. The world of Wonderland is so creepy and grotesque. I loved the nonsensical feel to it. It really is a darker version of Carroll's Wonderland, and even though it has its share of violence, it's written in such an elegant way that you can't help loving the descriptions and writing. What I didn't like: Jeb, the love interest. Oh, ick. He's a controlling jerk. Forget romance - he's not even that great of a friend to Alyssa! He doesn't believe in her or stick up for her, especially in the beginning. Even when he's in Wonderland and finally decides to believe it's all true, it still seems like he doesn't fully trust Alyssa to make decisions without his guidance. Most other reviewers seemed to dislike him too, and I can certainly see why. I was also bored for about the first 100 pages, until Alyssa actually entered Wonderland. When I read the summary, it sounded like Alyssa entered Wonderland right away, but it took about a third of the book for the action to truly start. I thought there was too much backstory in the beginning, and it just didn't seem to flow well. It felt like a stereotypical YA paranormal at first, but I'm glad the story started moving and becoming interesting once Alyssa was in Wonderland. Overall, I'm glad I read Splintered and fell in love with the enchantingly scary world of Wonderland. I didn't particularly connect with the characters besides Morpheus, and I disliked the romance and slow beginning, but the amazing world-building and gorgeous writing makes up for it. I'll probably be reading the sequel if my library gets it.